The Farmer’s Markets we do in the winter are doing very well. More and more folks want fresh natural food. So, we are running out of products and need to grind more. However, raising the floors has made the stones and everything connected to them out of level. In the photo you can see how it is done. “A” is where we removed the wedges at the top of the posts. “B” is where we drove in new wedges to raise the posts. “C” is the axle the stones set on and had to be readjusted to perfectly vertical once the posts were raised. “D” is the axle the pulleys ride on and has to be level so the flat belts will track in the center. Once this is done the bed stone had to be leveled. There are 4 large bolts under it to turn and level the stone. I get it as close as possible with level and then lower the runner stone to within about 1/4 inch of the bed stone. Start the runner stone spinning and slowly lower it until it starts touching somewhere around the stone. Look for the sparks. Then I turn the large bolt under sparks to lower the stone a hair and stop the sparking. I raise the other side until it sparks and then down a hair. A few more minute adjustments and it is pert near perfect. Then check all 4 bolts to make sure they are holding the stone equally. Then, clean, clean and clean some more and we are ready for grinding. 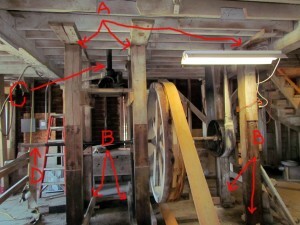 I am interesed in bring a group of high school age young men to tour the mill. We will be visiting colleges in the area and would like to take a tour of the mill. the dates would be march 29, or 30th if this would work for you. That would be fine. Let me know. I enjoy showing off the mill. Will you be at the Indy downtown Farmers’ Market before it ends for the winter (April 21)? I bought the buckwheat flour and found it exceptional and want more of your products. Do you come to Indy for the downtown market on Wednesdays in the summer? hOur company provides a wide variety of non prescription drugs. Take a look at our health portal in case you want to look better with a help of general health products. Our company offers a wide variety of non prescription products. Take a look at our health site in case you want to to feel healthier with a help generic supplements. Our company offers a wide variety of non prescription drugs. Take a look at our health website in case you want to look healthier with a help of generic supplements. Our company provides a wide variety of non prescription drugs. Visit our health site in case you want to look better with a help generic supplements. Our company provides a wide variety of non prescription drugs. Visit our health portal in case you want to to feel healthier with a help of generic supplements. Our company offers supreme quality weight loss products. Take a look at our health contributing site in case you want to strengthen your health. Our site offers a wide variety of non prescription drugs. Look at our health website in case you want to look healthier with a help general health products. Our company provides a wide variety of non prescription products. Take a look at our health site in case you want to feel better with a help of general health products. Our company provides generic pharmacy. Take a look at our health contributing website in case you want to feel healthier. Our company provides a wide variety of non prescription products. Look at our health site in case you want to feel better with a help generic supplements. Our company provides a wide variety of pharmacy. Visit our health contributing site in case you want to feel better.